DISCLAIMER: Please note, one or more persons directly involved in this production are immediate family or relatives of the Backstage Baltimore reviewer. The reviewer has vowed and striven to write an honest, fair, and thoughtful review, regardless of his or her connection with any member(s) of the cast of this production. With the recent release of production rights, we are definitely in the midst of a great Newsies explosion. With one generation of those who grew up in love with the original Disney movie and a new younger generation that has fallen in love with the Broadway production (available in full on Netflix), many have waited breathlessly for the opportunity to perform in or see this show on the local stage. The story of a crew of lovable and determined young people standing up from the powerlessness of poverty to take a stand for what is right and fair against a conniving businessman is a tale that is both timeless and timely. For these same reasons, any local production has big shoes in comparison to the film, the Broadway production readily available for screening, and the growing number of current productions. Street Lamp Productions presentation of Newsies (Book by Harvey Fierstein, Music by Alan Menken, and Lyrics by Jack Feldman), Directed and Choreographed by Bambi Johnson, with Music Direction by Nikki Tart, doesn’t necessarily get everything right and definitely battles some challenges in their current production, but they do most certainly get the things that matter most just right and land with a production that will certainly entertain audiences of all ages and all levels of familiarity with the script. The story surrounds the actual historic Newsboys’ strike under the leadership of the fictionalized Jack Kelly (Art Bookout). Bookout easily channels the youthful energy and excitement of Jack. His vocals are inconsistent at times, but his tone is absolutely lovely when he lands squarely on the mark. Bookout also has a tendency to go small and intense with his darker emotions. While this is likely to work exceptionally well in a smaller space, those moments were sometimes swallowed up in the large stage that was being utilized at Rising Sun High School. One simple fix, which may have helped some of these moments—including “Santa Fe” and “Something to Believe In”—would have been to move the scaffolding and the action downstage. Erin McArthur, as Katherine, would also have benefited from having her big number “Watch What Happens” moved to the forefront. McArthur’s strength lies in her acting and the little moments of natural reactions that she has throughout the song. Bringing her closer to the audience would have really helped to capitalize on the little nuances in her performance. There were some definite issues with the sound system that also could have been helped by bringing the solos and small scenes closer to the audience. Between the size of the stage and the sound issues, you couldn’t even really hear Jack during “I Never Planned on You,” as all focus was pulled by the Bowery Beauties who were further downstage. 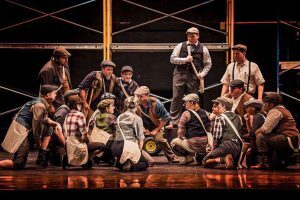 Luckily, most the scenes in Newsies are not small scenes, and, as soon as the rest of the cast joined Bookout and McArthur on stage everything came to life. Bookout quickly became a confident and competent leader when surrounded by the rest of the newsboys. The most important part of any production of Newsies has to be those big production numbers. Not surprisingly, the direction and choreography employed by Bambi Johnson in those moments is top-notch. The energetic and synchronized skill of the entire cast is true magic. The newspaper dance sequence in “Seize the Day” was truly legendary, as, even while working with a difficult prop, no one seemed to miss a beat. Likewise, “King of New York” was a stunning display of tap technique. The dance didn’t stop with the large dance numbers, as Johnson cleverly used dance as a mode to change sets and fill the brief moments in between scenes as well. The action kept going and keeping everything alive. Helping make that possible was a truly strong ensemble that operated together like a well-oiled machine. That ensemble also had no shortage of standout performances from some of the featured Newsies. Matthew Peterson was a warm and likable Race. Sammi Flickinger (Specs) showed off impressive ballet and tap technique at the forefront of every number. Ryan Conner (Henry) was always alive with his reactions and bright smile. Stephanie Peterson (JoJo) brought this loveable, innocent energy to her character and dazzled with her athleticism as a dancer. Connor Reagan (Buttons) and Delany Flickinger (Mush) entertained with well-delivered one-liners. Any time that you glanced at Meg Smith (Newsie), she was in the moment and living the character. There was never a time that any one of the ensemble members seemed distracted or unprepared. Each one was focused in the moment, and you could feel the energy and chemistry that all of them brought as a team. The whole concept in Newsies is the whole is more important that the individual and we are at our best when we work together, and this production nailed that. Another example of taking a small featured part and really making it shine was Patricia Egner as Hannah. She really created an authentic character and brought great humor and energy to her scenes. Still, two performances managed to really stand out among the others bringing something more to the entire production. The first was Austin Barnes as Davey. In addition to his beautiful tenor vocals, Barnes provided the audience with a master class in acting performance. A difficult skill is to show how a character goes through a radical transform. In some hands, the transformation is too subtle. In others, it is too sudden or too vast. The core of Barnes’ Davey never changes. He is clearly playing the same character from the beginning to the end, and yet Davey at the end is a grown, changed man from Davey at the beginning. From subtle things that he does with his body language and his vocal patterns to larger choices that he makes in line delivery and overt reactions, Barnes shows Davey’s slow and gradual progression into someone more confident and more compassionate. His performance was truly technique at its finest. The heart and soul of this production, fittingly as he is the real heart and soul behind Jack, was Josh Willig’s flawless portrayal of Crutchie. To start with, Willig showed unbelievable body control in the way that he carried his leg so still and at such an odd angle that is truly looked crippled. It was impossible to catch him letting down his guard about the leg. While you would think that would require all of his focus, he was in no way distracted from a performance that seemed completely genuine. He embodied the utter sweetness of Crutchie and truly gripped hearts with his vocally gorgeous rendition of “Letter from the Refuge.” Willig was honestly just delightful to watch. Several of the weaknesses in this production were beyond control (being in a rented space), like the before mentioned sound system and the lack of real theatrical lights. However, the one misstep may have been in the character choices for the “adult” characters in the production, specifically Joseph Pulitzer (Ted Cregger) and Medda Larkin (Jennifer McDonald). Both Cregger and McDonald have big personalities and big voices, but the choice was made to play these characters in the vein of over-the-top humor that didn’t quite resonate with the more subtle and realistic character choices made by the rest of the cast. It may have been intentional to further set the adults apart from our heroes, but it didn’t quite land. 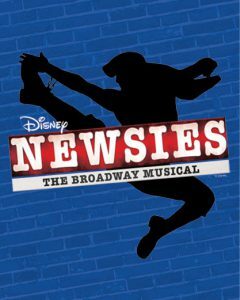 Minor flaws aside, this production is worth seeing and will definitely stand out even in a sea of Newsies productions. The choreography alone is enough to enthrall, and, once you add the chemistry and comradery of the cast that brings it to life, audience members won’t be able to help but to smile and to cheer. Layer on top of the that the heart and the spirit of the story of the underdog being heard shared with sincerity and passion, and you are likely to leave ready to come back and see it again. 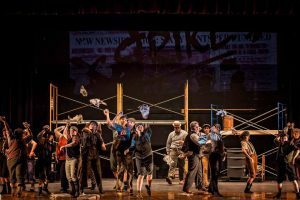 This is what I thought of Street Lamp Productions production of Newsies… what did you think? Please feel free to leave a comment! 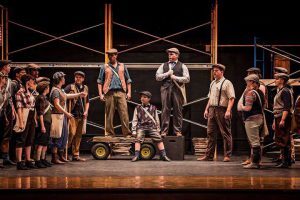 Newsies will play through December 9 at Street Lamp Productions at the Rising Sun High School theatre, 100 Tiger Dr, North East, MD 21901. For tickets, call 410-658-5088, email streetlamparts@gmail.com, or purchase the online.